Shoppers Drug Mart has new special Optimum Offers for the holidays! Plus when you subscribe you can get 2000 Free Optimum Points! 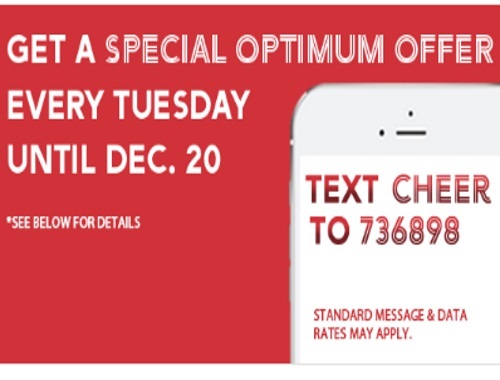 Get a special Optimum offer every Tuesday until December 20. Follow the directions below. 4. You will receive another text asking for the last 9 digits in your Optimum Account so that they can credit the points (points will be added in January 2017). Standard message and data rates may apply.To opt out at any time, text the word ‘STOP’ or ‘ARRET’ to 736898. For help, text the word ‘HELP’ or ‘AIDE’ to 736898. Standard message and data rates may apply. We also posted another offer to get 2500 Free Optimum Points here.